Two weeks ago, Jon and I celebrated the wedding of good friends in the rolling countryside just south of Dublin. Luck was with us and the weather that weekend was sunny and mild, and while most of the weekend was spent at wedding festivities (such that I didn’t get a chance to eat out in local restaurants), the parts of County Wicklow we saw were so pretty that I thought I’d do a brief write-up anyway. 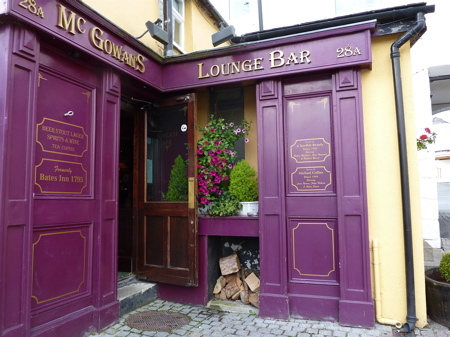 We spent one afternoon walking around the small town of Rathdrum, whose highlight is McGowan’s Lounge Bar, which is connected to the Cartoon Inn. The Lounge Bar entrance is labeled with signs telling you that Michael Collins was filmed here, and the Cartoon Inn portion is amusingly wall-papered with old cartoons. Rathdrum used to host the Rathdrum International Cartoon Festival, you see. There’s not much to see in town, so if you’re in the area, I’d skip Rathdrum itself and visit nearby Avondale House instead. I’ve visited Ireland only twice, but based on both trips, I agree with everyone who says Ireland’s beauty lies in the countryside, not in its towns and cities. Jon and I didn’t like our B&B (see below for more deets), but I will say the full Irish breakfast hit the spot the morning after the wedding reception. With a couple of hours to kill before our flight from Dublin back to London, Jon and I enjoyed the sunshine and people-watching in St. Stephen’s Green and then walked down the unimaginably-crowded, chain-store-packed Grafton Street. 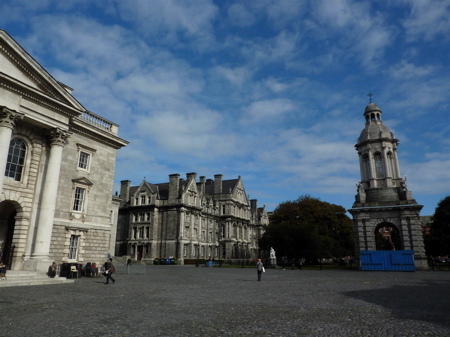 We ended our time in Dublin by paying 9 euros each to see the Book of Kells at Trinity College Library, which was an underwhelming experience. I knew going in that the Book was a really old, illuminated Bible, so if I’d thought about it a little more, I probably could’ve predicted that it’d be disappointing. After all, I remember seeing the much-older Dead Sea Scrolls for free at the New York Public Library, and there was no shortage of illuminated manuscripts for perusal at the university library when I was young ‘un. So yeah – seeing four pages of the Book of Kells – not worth our 18 euros. 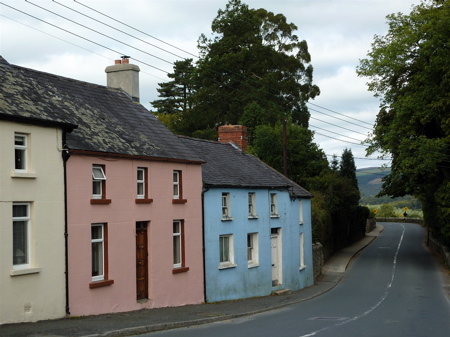 Overall, I’d love to return to Wicklow and see more of the countryside. So the next time you’re planning a trip to Dublin, schedule some time in Wicklow, too. Jon and I stayed at a small B&B near Rathdrum called Birchdale House. It was inexpensive (70 euros a night) and close to the wedding venue. But I wouldn’t recommend it. When Jon and I arrived, the B&B owner told us he’d accidentally double booked the room we’d reserved and so we’d have to take a room without a bathroom. He knocked 10 euros off the price, but I’d rather he’d called us earlier to tell us about the mistake so that we could have chosen to stay somewhere else. Our room was tiny; the sheets were scratchy; and overall, the room still wasn’t worth paying 60 euros a night for. If you haven’t rented a car and instead have taken the train from Dublin to Arklow, I’d highly recommend Aughrim Cabs to get around once you’re in that part of Wicklow. They were super reliable and friendly, and although most of our cab rides were 20-minutes long, the fare always seemed to be 10 euros. We used a taxi between Dublin City Center and Dublin Airport, costing about 25 euros for the 30-minute ride. There’s an express bus that costs just 12 euros return, but we were too short on time to figure out where the bus stops were. For the London-Dublin route, there are a million flights to choose from. Jon and I used RyanAir because Stansted is handy to Liverpool Street station, near both our offices. 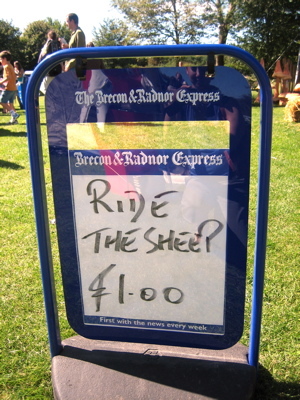 Our tickets cost £75 each for a return ticket. From a cost perspective, there’s no reason *not* to return to Ireland soon. To read about my only other visit to Ireland (embarrassingly, five years ago), click here. In addition to all the scenic hikes you can do in Wales (last weekend, we did a 9-mile loop called the “Waterfalls and Ridges” hike that I’d highly recommend), there are lots of castles to visit, too. “Real” castles. The kind you’d draw as a kid, with crenellated turrets, keeps, moats, flagpoles and everything. I’m hazy (read: pretty ignorant) on Welsh history, but the pattern of history underlying most of the castles seems to be: Romans build forts; Norman lords start castles on top of the forts to show that William the Conqueror meant business; English kings fortified the castles to keep down those pesky Welsh rebels; hundreds of years of fighting and sieges ensue. Take, for example, Cardiff Castle (photo above), which sits in the middle of Cardiff. It’s literally the last bastion of medieval history in a downtown area overrun by the usual high-street chain stores. The “pattern” I just described applies to the castle keep, for sure, but what’s quirky about Cardiff Castle is the Victorian-era mansion that sits on a wide lawn next to the keep. Last weekend, Jon and I returned to Wales, and this time, we drove up and dragged along three friends. Of course, none of us are UK natives, so you have to picture five otherwise capable adults trying to figure out how to drive on the left without swiping cars in neighboring lanes. Oh, and it turns out weekend traffic fleeing the city is not just a NY-DC thing, so what should have been a 2.5-hour drive to Cardiff turned into a 5-hour one. The snazzy rest stops along the M4 made the trip a lot easier, though. Sure, they’re unvarying (Burger King, M&S, Upper Crust, WH Smith), but the ones we hit were also uniformly clean and modern. Thumbs up to highway-related infrastructure between London and Cardiff. But back to restaurants in south Wales. Although the five of us didn’t dine out much last weekend, I’m reminded to share a few thoughts on better-known area restaurants Jon and I tried during our trip in late August. Generally, we were unimpressed by the food we had in Cardiff (think big chains – mid-range and low-end), but once we drove out to the surrounding areas, we found restaurants serving well-prepared meals made from locally-sourced ingredients. Molecular gastronomy? Not in south Wales. But after hiking the rugged Welsh hills all day, I could think of nothing better than, say, a perfectly-rare and juicy rack of lamb. The Foxhunter gastropub in Nantyderry (located in the eastern part of Brecon Beacons national park, near the bustling metropolises of Usk and Abergavenny) was excellent in all ways: decor, service and food. The decor is rustic in a Pottery Barn-comfortable way: dark, polished wood furniture accessorized with hurricane vases, pillar candles and cream curtains. The service was friendly and attentive (note that in Wales, you’re first shown to the bar for a drink even if you’re table’s ready, and when you indicate you’re done with your aperitif, only then are you shown to your table). The Foxhunter’s menu offered fresh, local produce prepared with a light Mediterranean influence. There was nothing mind-bendingly creative for dinner, but this is the country life, writ fancy. The high quality of the ingredients was the star feature at the Foxhunter. We knew we were in for a treat when our meal started with warm, fresh-baked focaccia and fluffy, yeasty rolls. The latter was served so warm that after I cracked open the crust, the rich, creamy butter I dabbed (OK, fine, smeared) on melted instantly. Jon’s fried courgette blossoms stuffed with ricotta was out of this world. The batter coating was thin and crispy, and the ricotta was melt-in-your-mouth creamy. I think it’s the best fried courgette blossoms we’ve ever had, and we have quite a sample size to draw from, I assure you. My shrimp and scallops were the one disappointment of my meal. The diavolo sauce was excellent – sweet tomatoes with a spicy finish – but the shrimp and scallops were overcooked to slight toughness, and whatever flavour was left was masked by the strong sauce. It was obvious I should have gotten courgette blossoms! Jon’s whole lobster was small, but he couldn’t resist ordering it because it’s been a long time since we’ve seen lobster on a menu. Lobsters apparently live in the waters around south Wales. (They are otherwise tres American, did you know?) In any event, though small, the lobster was super juicy and sweet, and Jon was careful to clean out every last bit on his plate. We may have imagined it, but I think there were a lot of envious eyes on Jon’s lobster that night. My rack of lamb was outstanding, though sadly, it hadn’t been trimmed, so even I and my gluttonous ways had to admit defeat and trim off some of the 2” layer of fat on each piece. Still, excellent lamb. Appetizers were £8-10, and mains were £15-25. It’s pricey, especially for the area, but worth it. 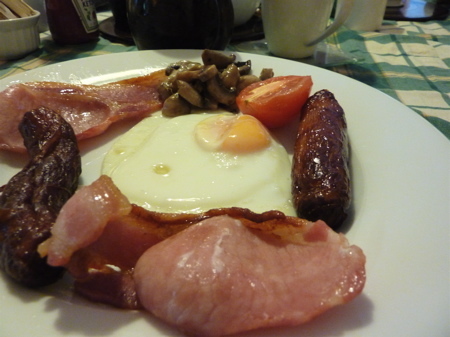 Definitely stop by the Foxhunter when in Brecon Beacons, or just south Wales, generally. During our day by the seaside on the Gower peninsula, we had dinner at the Fairy Hill restaurant. I was a little disappointed that in the evening, it was too chilly to dine out on the restaurant’s pretty terrace, but in summertime, definitely go for that option. The food at Fairy Hill was good, but I’d make way more effort to stop by the Foxhunter before returning to Fairy Hill. I think Fairy Hill is in its faded glory phase. The menu was more ambitious than at the Foxhunter, and the decor had a “we’re the fancy restaurant in town” look circa 1990, but the food had its high notes still. For example, our meal started with amuses bouche. An elegant thought, but most of them were stale, so really, the restaurant shouldn’t have bothered. Other than the cheese beignets, which were served hot, at least, the salmon and the foie gras both tasted like they’d been hanging out in the fridge all day on old bread, and serving the amuses on a napkin heightened the sense of non-freshness as all of them were a little stuck to the napkin. The sun-dried tomato bread was crumbly and buttery. Almost cakelike. I’m no sun-dried tomato fan (for no other reason than that it seems totally 80s, which I suppose means I need to work past the idea of trendy vs. unfashionable food), but in the bread, the sweet tanginess of the sun-dried tomato was the icing on the cakelike bread. My scallops appetiser was a high note of the meal. Very tender and sweet. I was so relieved it wasn’t overcooked. (You never know what might happen in the benighted countryside!) The wrong note was the mango-and-red-pepper salsa that accompanied the scallops. It was totally unnecessary and too sweet. Jon’s baby dover sole appetiser was buttery and tender, which is why I left with the impression that the appetizers at Fairy Hill are worthwhile, and the main courses respectable enough. (Jon’s sea bass and my roast chicken were both good, but we could probably cook the same at home). The menu was either £30 prix fixe for two courses or £40 for three. Our tab was about £100, which included wine. I’d go back if I were in the Gower during the summer and could eat outdoors. Otherwise, next time I’m in the Gower, I’ll probably try another place, particularly because it’s a 1.5-hour drive to the resto from Cardiff. On our last day in Wales, Jon and I debated whether to stay in Cardiff and check out the Cardiff Castle or drive about 20 miles east to see Tintern Abbey. Jon settled the matter when he said: “If it’s good enough for Wordsworth, it’s good enough for us.” For those of you wondering what Jon meant, you’ve clearly forgotten all the useful knowledge gleaned in high school English class! 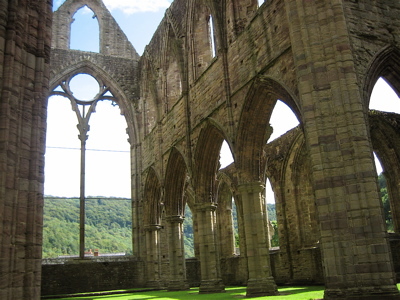 In the late 1700s, William Wordsworth wrote “Lines Composed a Few Miles Above Tintern Abbey,” because he was inspired by the beauty of the Abbey ruins. So off we went to be similarly inspired. Our first impression was not promising. Less than 50 feet away from the Abbey ruins are a parking lot, souvenir vendors, and a forgettable pub. The aggravation of trying to snag one of the parking spots was something like circling the mall garage on Black Friday. Finally, we broke down and parked in the pub’s parking lot, agreeing to buy a few watery pints to make it convincing that we were pub patrons entitled to use the parking lot. I was tempted to just turn around and go home, but it seemed a waste of a 30-minute drive to do that, so we paid our £3.50 admission fee and our £1 for audioguide and hoped for the best. 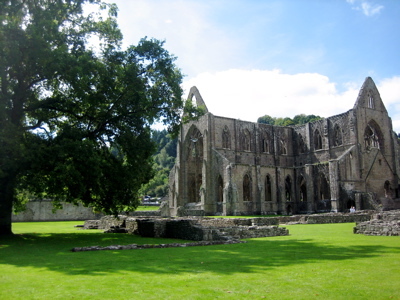 In hindsight, it makes sense that if the Abbey ruins were a major tourist attraction in Wordsworth’s day, it’d be seriously tourist-fied in the 21st century. Once you enter the Abbey grounds, it’s surprisingly easy to forget all the souvenir-and-tarmac tackiness. The audioguide was the best £1 we’ve ever spent, and we learned a lot about the original use of the Abbey by the Cistercian monks in the 1100s. Apparently these guys sought to be very practical and useful, so manual labor in the fields was a major activity at the Abbey. None of that sissy illuminated manuscript business for them! As the U.S. celebrates Labor Day this weekend, I think about the summer getaways to cool, crisp New England beaches that I miss very much. But then I think about how much our trip to Wales’s Gower Peninsula last weekend felt like a trip to Maine or Cape Cod. And finally the light has come on: England came before New England, and there might be a reason the latter was named just so. Gower Peninsula juts into the Atlantic just an hour west of Cardiff, which means that like the Brecon Beacons, it’s an easy day trip from Cardiff. As we made our way past the industrial-looking shores of Swansea, Jon and I were thrilled to see sandy beaches when we rounded the Swansea Bay to Mumbles, which is the first big beach town on the peninsula. Determined to reach the peninsula’s most western point, Rhossili, we snaked our way through small, picturesque beach towns for over an hour and a half. While the distance across the peninsula is not much in miles (i.e., 19 miles from east to west), the roads are small and windy, and they don’t accommodate a lot of traffic. We encountered much of the sharp-bends-in-a- one-lane-road situation but miraculously managed to avoid head-on collisions. I took in the scenery of tidy cottages, blooming flower trellises and hilly, green terrain, which was great for the first half hour on the peninsula, but because Jon and I hadn’t planned for slow going and thought we’d reach Rhossili in time for lunch, we were starving during our drive. So we tried a cafe at Beynon’s Farm, a pick-your-own in the town of Nicholaston, and the cheese-and-onion pasties were amazingly good and just £1.20 each. Flaky, buttery pastry shell and a savoury filing that only hot cheese, potato and onion can create (a la the best knish you’ve ever had in your life). Cornwall Pasty Company, eat your heart out. 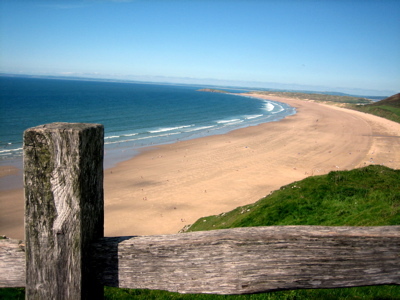 Rhossili Beach (pictured above) was beautiful. We hiked up a steep ridge that follows the curve of the beach, called the Rhossili Downs, and from the Downs, we had views of the slithery rock formation called Worm’s Head (photo at top of post) as well as of farmland and beaches for miles around. I did wonder why a steep hill would be called a Down, and of course Wikpedia came to the rescue. Beautiful as it is, Rhossili Beach seems not the right place for a swim. I thought the water was kind of chilly, but Jon jumped in and had a fab time, and he wasn’t the only one. So maybe you just need to be a polar bear kind of guy. 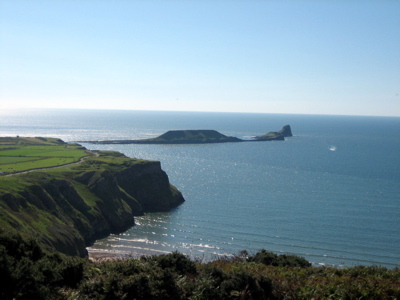 Even though I didn’t enjoy the water, I look forward to going back to Rhossili (or the Gower peninsula, generally) for the hikes, views, and the chance to park myself on the sand and read a book to the soundtrack of crashing waves. Completing our “Summer of the UK” series, Jon and I spent this past long weekend in southern Wales, which is about a 2-hour train ride west of London. We completely lucked out and had sunny weather from Saturday to Monday, and now I have only good things to say about Wales. The first thing I noticed when I arrived at Cardiff Central Station were all the signs in Welsh. Yes indeed, Welsh is a living language in Wales, and if you have an aversion to guttural sounds and double consonants galore, then Welsh is not for you. Fortunately for me, all the Welsh signs include English translations below. Jon and I quickly abandoned Cardiff and headed for the hills. We dropped by the Europcar, flashed a US license, and off we went. Driving on the left? No problem, of course. Brecon Beacons National Park (Bannau Brycheiniog for you Welsh speakers) is a 45-minute drive north of Cardiff on the A470. It’s not like an American national park, where development is prohibited. Rather, it seems a lot of the land in the park is privately owned, but land use is strictly controlled by a National Park planning authority. So on the one hand, there are towns (with homes and shops) within the park boundaries, but on the other, the towns are quaint and convenient, and all the lonely natural beauty of the mountains and fields seems intact. We picked up a fresh, nutty seven-grain loaf from the Caroline’s Real Bread stand as well as some chive-flavored fresh goat’s cheese from the Cothi Valley Goats cheese stand. It was hard to resist buying more when everything looked so fresh, but when you have to lug the food around on your back for a couple of hours, you learn to control yourself. 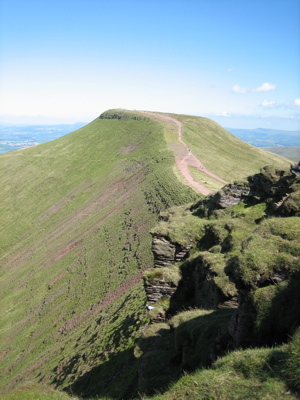 Provisioned up, we hiked up the (of course, tallest) peak, Pen-y-Fan. It took us less than an hour to reach the top, mostly because Pen y Fan isn’t very tall, but I would characterise the hike as pretty strenuous because the trail goes straight to the top through open fields. I don’t hike very often, but when I do, I prefer the kind where you’re in shady, leafy bits so that you appreciate the open, sunny vistas more. I also prefer a little switchbacking to make the inclines less crazy. (All spoken like the true outdoorswoman I am). In any case, the summit of Pen-y-Fan is just a 5 minutes’ hike from another peak, Corn Du, so we devoured our Summer Fayre goodies at Corn Du, snapped a photo of Pen-y-Fan (at top of this post), continued on to Pen-y-Fan, and then started the slow descent. The views in every direction from Corn Du and Pen-y-Fan were stunning, but I felt a little queasy looking at the steep slopes. You start to imagine that one false step is going to send you rolling down these dramatic hills. 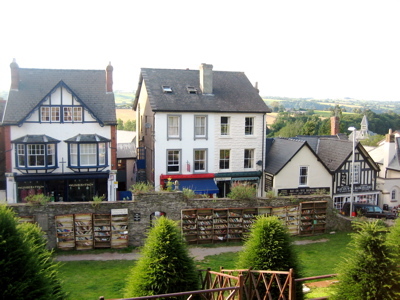 Having done my healthy outdoor activity for the day, Jon and I drove another 30 minutes north to reach Hay-on-Wye, a town famous for its large number of bookshops. A book town! My kind of place. The streets in town are quaint and picturesque: Window boxes spilling over with bright geraniums and petunias; half-timber buildings; and of course bookstores everywhere, even outdoors! When we were in the town center, we noticed hundreds of books left outside on shelves, and it turns out they’re sold on the honor system. If you decide to buy a book, you deposit your money in a designated metal lock box. I loved browsing the bookstores, which ran the gamut in degree of specialization and organization. 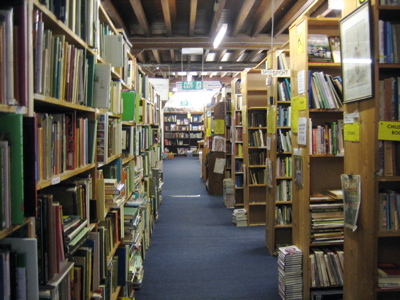 There were stores selling overstock of best sellers on the cheap and others offering only rare first editions priced at hundres of pounds. Many shops had only the most high-level organization (“Fiction” vs “Non-Fiction,” for example), and finding anything within these categories was a total crap shoot. I wondered how these places could possibly make money, because you’d be hard pressed to walk in and find a specific book. I know, because I spent a lot of time trying to find E.L. Doctorow’s “The March,” which I will obviously now order from amazon.com. Our favorite shop was the Richard Booth bookseller, which was a musty old jumble, but largely organized the way you’d expect in a mega-chain store (so you could actually find a specific book). Walking through the damp, cool basement level of the store, I felt like I was back in the forgotten stacks of Firestone Library, three floors underground. And yes, this was a good thing. I ended up just buying yet another (my third?) copy of Pride and Prejudice, and Jon and I found a sunny bench and spent a few hours reading outdoors in perhaps the world’s only Book Town. Because Jon and I rarely travel outside of London to see the rest of the UK, we’ve designated this summer the Summer of Britain (catchy, no?). As part of this exciting series, Jon and I spent 36 hours in Edinburgh this past weekend. 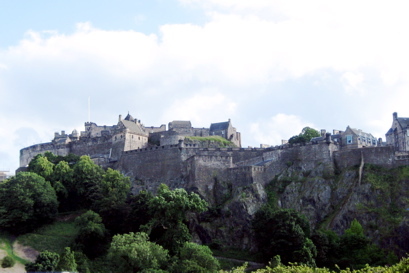 Edinburgh, like many European cities, has an Old Town and a New Town. Everything is relative, of course, and the “New” Town is a youthful 300 years old, whereas the Old Town dates back to the 11th century, when Edinburgh Castle (see photo at top of this post) was built. Because most of the interesting restaurants and shops we’d researched are located in the New Town, I prefer it to the Old Town, even though the Castle and the Royal Mile (i.e., the Big Tourist Attractions) are in the Old Town. Our weekend was a relaxing mix of eating and walking around, with a Castle thrown in. In many ways, Edinburgh is like London Lite. There are the same restaurant and shop chains; same currency; same language. But of course there are also “we are a separate country” quirks. The currency may be the Great British Pound, but local banks print their own legal tender “Scottish Pound” notes. Scots speak, you know, Scots. Pub chalkboards advertise “haggis, neeps and tatties” instead of fish and chips. The list of these small differences is endless, and the gist is that I can see why Scots still believe they live in a separate country. Jon and I stayed in a boutique hotel called Le Monde, which is in the New Town. 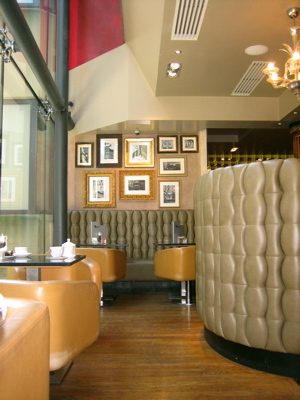 You couldn’t beat the location on George Street, close to Multrees Walk (yay Harvey Nicks!) and a 10-minute walk from the Castle, and you certainly couldn’t beat the service and style. Even after we’d booked at Le Monde because of rave reviews on TripAdvisor, we were a little concerned about the hotel’s “around the world” theme (i.e., there are 18 rooms, each named after and decorated in the style of a different world city). But I forgave any cheesiness immediately upon sinking into our room’s feather bed and turning on the giant flat screen TV. And of course I have to mention that the hotel was incredibly helpful when we realized we’d left our passports in the room safe. Two thumbs up. Thinking that most shops would be closed on a Sunday, we decided to “save” the obligatory Edinburgh Castle visit for Sunday, so we spent Saturday exploring Old Town and the Edinburgh Farmer’s Market. First, the Farmer’s Market. It’s a 100-yard lineup of uniform-looking stalls on a road below Edinburgh Castle called “Castle Terrace.” I was disappointed that there wasn’t much produce on offer. It is summertime, after all. And while the uniform awnings keep the market tidy-looking, it seems wrong to have a farmer’s market look so antiseptic. 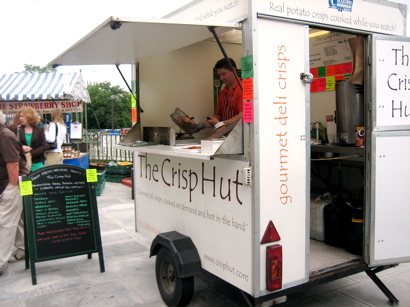 But I perked up when I saw “the Crisp Hut.” My kind of vendor. Freshly-fried potato chips flavoured any way you like for £2 a bag. Most excellent. I think every farmer’s market should have one! Second, the Royal Mile. The main Old Town drag is the Royal Mile, which was built 900 years ago to connect Holyrood House (the Queen’s stopover when she travels from Windsor to Balmoral castles) and the Edinburgh Castle (among other things, the birthplace of King James I). If you’re thinking the Royal Mile is a tasteful, sedate little road, you’re sadly mistaken. Although the road is cobblestone and lined with imposing stone buildings, it’s chock a block with tourist traps and souvenir shops. Take, for example, the “Scotch Whisky Experience,” where, for £9, you can get in a plastic barrel ride that takes you through the history of whisky making through the ages. Hmm, no thanks. Up the street from the Whisky Experience, Jon and I ducked past the Bravehart look-alike (you know, you snap a photo and then you give him a pound for the privilege) and into one building that advertised demonstrations of Scottish wool making. As we suspected, the place was a most entertaining example of tourist retail masquerading as an educational experience. I followed a path designated by arrows through racks of overpriced wool and cashmere goods (many in plaid, obviously), and every now and then, I’d pass a scary plastic mannequin posed over an old-fashioned loom (the “educational” part, I suppose). 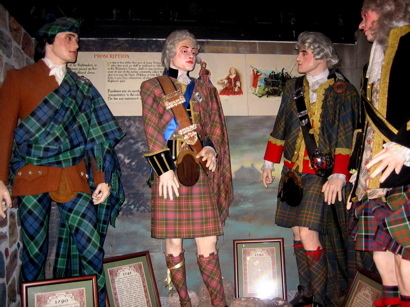 By staying on the path, I eventually hit the tourist schlock jackpot: for just £20, you could have your photo taken in “ancient Scottish costume,” and if you opted out, you were still in for a treat because the nook behind the photo studio included a “history of kilts” exhibition that consisted of the world’s scariest-looking mannequins in variations of the kilt through time. I honestly enjoyed all the unadulterated schlock in the Old Town. Even the Castle, while impressive and historic, had its moments, particularly when the audiotour got in on the act. The narrator informed me that in addition to the Castle’s role in the drama triangle of Mary Queen of Scots–Elizabeth I–James I, there were many locations within the Castle walls where I might pick up a Castle souvenir. I mean, we’re not talking about one tourist shop housed in converted stables (as is usual at castles, it seems). We’re talking about a tourist shop located in seemingly every free-standing building throughout the castle grounds. How many key chains, cheap scotch whisky and shortbread can one tourist site push? Tons, I guess. The one last thing I’ll add about the Castle is how dinky the Scottish Honour (i.e., the Scottish Crown Jewels) are. If you’ve seen the stash at the Tower of London, you’ll understand the disappointment of seeing a single crown with pearls (we all know pearls ain’t no diamonds on the bling scale) and a necklace or two. In any case, the Castle was definitely the highlight in terms of big “sights” in Edinburgh, and otherwise, Jon and I did a lot of wandering down small alleys between buildings (called “closes”) and shopped at the same shops that are in London. Which brings me to my favorite activity, of course: Eating. 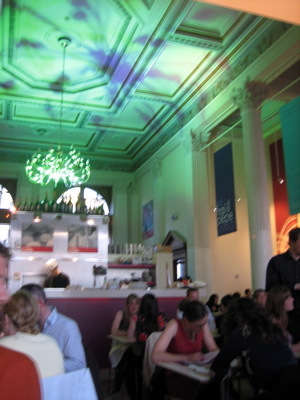 Generally, service was friendly and attentive at every place we ate in Edinburgh. Food was good only when we stuck with seafood. Otherwise, I’d say most dishes sounded a lot nicer on the menu than they tasted. We have to admit, we were a little too London-centric and couldn’t conceive of having to make any reservations in advance, but trying to get reservations at Martin Wishart taught us a lesson: there are, in fact, highly-reputable Edinburgh restos that require advance booking. Centotre is an Italian place we tried because it’s housed in a converted bank, and I love those kinds of places. Remember the Blue Water Grill? I’m never disappointed by the high ceilings, the dramatic dome, the vaguely neoclassical look inside. Centotre had all these, but the greenish lighting kind of threw me, as did the generic-looking hangings that looked like the sort of thing a museum would hang to advertise its latest exhibition. The food at Centotre was, overall, not worth the prices (which weren’t even high). Jon’s polpette (i.e., meatballs) were dry and flavourless in a way that no amount of overly-acidic tomato sauce could mask. And the Manzoni Moscato rose prosecco was digustingly syrupy despite the menu description that it’d be “medium dry.” At £5.50 a glass, we were outraged. (OK, fine, our fault for thinking a rose prosecco might be good, but I suppose we were spoiled by all our fantastic rose champagnes in France). The only high point in our £80 meal at Centotre was my spaghetti alle vongole. I’ve never eaten such plump, juicy clams, which tipped us off to the idea that we should stick with seafood in Edinburgh. 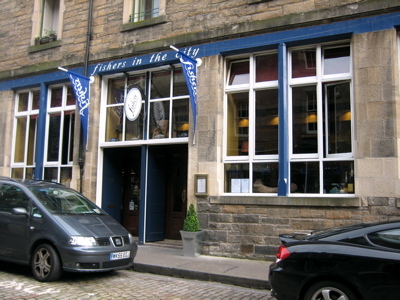 Our stand-out meal of the weekend was lunch at Fisher’s in the City. Seafood, of course. A nice, casual-elegant interior. Fresh seafood well prepared at good prices (£12-20 per main course). Nothing super creative, but I don’t think you need to be creative when creamy fish chowder is surprisingly light and flavourful and a gazllion steamed mussels arrive with nary a closed shell in sight. And service was incredibly friendly and attentive, which is a real treat in the UK. Valvona & Crolla, a Dean & Deluca-type place located on Multree’s Walk, was perfect for delicious pastries and strong cappuccinos when we got tired of shopping. Multree’s Walk is a new-looking open-air shopping complex that’s anchored by Louis Vouie and Harvey Nicks, so I’m not surprised Valvona & Crolla includes both a sophisticated café downstairs and a fancier restaurant upstairs. The owners also own Centotre. 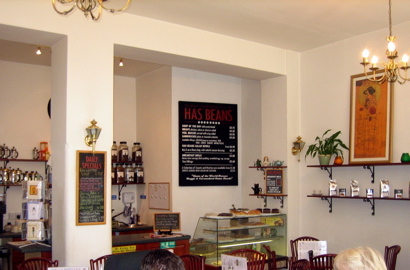 Has Beans Café is a cheerful, crunchy-looking (think whimsical, mismatched teapots for décor) organic place on the Royal Mile. It was the least touristy place we could find when looking for a lunch break. Wraps and sandwiches for £3-5, but what stole the show for me was a delicious lentil soup. Overall, Edinburgh was a small, pretty city, but I don’t think I’d make it another destination trip unless it’s time for the Festival. Its charms (history, scenic streets, a few nice restaurants and cafes) are ones I can also find in London, but I do think the place would make an excellent home base for exploring what I hear is the gorgeous surrounding countryside. 29 July 2007 Update: Check out this weekend’s New York Times Travel section article, “36 Hours in Edinburgh.” I agree that George Street is the place to be and that the Castle is worth a visit, and that’s all the overlap we have.